Syria's Splintered Opposition: Who Is Running the War Against the Regime? Russia and China Challenge the West on Syria: What Implications for Iran? Syria is no longer sliding into war or staring at the abyss of warfare. Syria is at war. 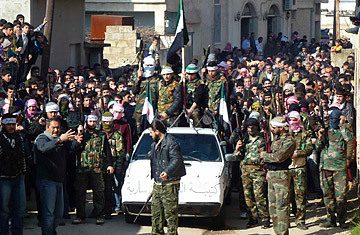 Although peaceful protesters still take to the streets by the thousands, the phenomenon that is the Free Syrian Army (FSA) is, short of a palace coup, becoming the main actor in a revolution that is growing nastier by the day. A source in the besieged city of Homs told TIME on Monday, Feb. 6, that government forces have continued to bombard residential areas with some of the heaviest barrages in the 10 months since the protests began, with perhaps 25 civilians dead in two hours of shelling and sniper fire in just one district. On one side of this clearly asymmetrical conflict is President Bashar Assad and his army of more than 200,000 men, its officer corps largely intact, a loyalty forged by shared interests and fears  and blood spilled as a result. Opposing them is the FSA, a loose franchise of lightly armed military defectors (and in some areas civilians) waging a growing number of localized guerrilla campaigns in their hometowns and cities with minimal centralized control from the FSA's nominal leadership, which is based across the border in Turkey. It's unclear how big this rebel force is. Colonel Riad al-As'aad, the head of the FSA, has boasted of as many as 40,000 men  a claim impossible to verify and probably part of a psychological campaign to encourage further defections. General Mustafa al-Sheikh, the highest-ranking breakaway to date, has gone further, telling a British newspaper that President Assad's army is just weeks away from collapsing. Few would concur. Perhaps that is because Sheikh and As'aad are rivals. On Sunday, the general announced the formation of the High Syrian Council for the Liberation of Syria, a move that is likely to cement a split within the armed opposition, given that the FSA's deputy commander Colonel Malik Kurdi told TIME Sheikh's move was nothing short of "a knife in the back of the revolution." "We were surprised by this," Kurdi said by phone from Turkey. "General Sheikh defected and did not join us. He announced this council  it's his business. We have nothing to do with it. We don't know anything about it or its aims, but we question its formation at this point. We think it's an attempt to split the armed opposition." It is debatable whether the FSA's leadership in Turkey serves anything more than a p.r. function  a source for media and Western diplomats  without real command of FSA fighters on the ground. Now a separate and rival authority under General Sheikh is likely to confuse things in an already disunited opposition front, even as Assad escalates his attacks and takes an ever higher daily death toll. Bassma Kodmani, spokeswoman for the Syrian National Council (SNC), the de facto political opposition group, says the SNC was also wary of Sheikh's announcement. "It's not something that we fully know what were the issues behind it," Kodmani tells TIME. "We realize there are some tensions related to the timing of the event. We are working to ensure that the military command will remain united." Other towns, like Rastan (which is near Homs and surrounded by flat farmland) and Jabal al-Zawiya in the north, have become rebel military strongholds and scenes of intense clashes with loyalists. The rebels have at times gained and held territory, but only briefly before loyalists forcefully pushed back. Even Zabadani is reportedly once again being shelled. Still, the regime defectors have some advantages. The military breakaways tend to return to their hometowns, enabling even a small group to tap into a much wider social and clan-based network. In the early days of what was a predominantly peaceful uprising, bands of army defectors across the country turned away civilians volunteering to join their ranks, in a bid to maintain some semblance of military hierarchy and discipline. Now, in amateur videos posted on YouTube, some units are openly calling for civilian volunteers. Kurdi insists that's not part of the FSA's general strategy. Critics counter that a command based in Turkey cannot dictate terms to men fighting and dying in their homeland. Kurdi responds that military commanders the world over need not necessarily be based in an area to issue orders for it. "A command can be anywhere, in a city, in a town," he says. "In any military command, orders are issued via communications. we count on these communications." They also count on weapons entering clandestinely from neighboring countries, including Lebanon, Turkey, Jordan and Iraq, as well as what Kurdi terms the "regime's smuggling gangs" that sell weapons to defectors. Syria was not a weaponized society, unlike Iraq, where gun ownership was common before the fall of Saddam Hussein's regime. But after almost 11 months of being shot at, some Syrians have found ways to protect themselves and start shooting back. A Syrian expatriate and human-rights activist who works closely with refugees in Jordan says that every Syrian man who flees across the border is "FSA in waiting." Kalashnikovs were going for about $1,600 each, he says  about half the price of those sold on the black market in Lebanon. Most of the men go back into Syria, the activist says, as soon as they secure a weapon. Kodmani says unifying armed groups on the ground "is the big challenge today." Although the SNC had not been quick to endorse the FSA, insisting on peaceful rather than military means to bring down the regime, it has since come out in support of the armed defectors, offering to find it funding but not weapons. "There is going to be more of a role for the FSA in the continuation of the struggle against the regime," Kodmani says, adding that support for the FSA is predicated "first and foremost" on "helping integrate those [armed] groups that if not integrated might operate on the ground, which is a concern. It's not about throwing money and arms at them. It's first and foremost about unifying them under one command." Syrians don't have to look far to see how militias, especially those with a sectarian hue, can ravage a country: neighboring Lebanon and Iraq are bloody examples of that. They are also examples of the price proxy wars can extract from a local population. The international battle lines over Syria are clearly drawn. Russia and Iran continue to politically back and arm Assad, while Qatar is leading the Arab charge against the regime, along with Turkey, the U.S., France and other Western powers. There is much talk that Qatar  which financed, armed and trained Libya's rebels  may do the same for Syria's. Kurdi wouldn't state whether that had moved from notion to fact, saying only that the FSA needed weapons to "at least make us on par with the regime."